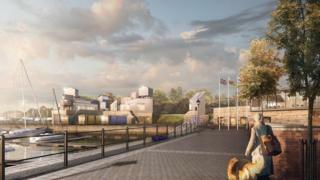 A proposal to redevelop a marina has been awarded £5m by the government's Coastal Communities Fund (CCF). The Onion Collective project comprises a two-storey gallery, restaurant, workshops and self-catering units at East Quay in Watchet. The group previously received a £1.5m loan from West Somerset Council towards the project. Director Georgie Grant said the CCF grant award was "absolutely incredible" and "the best news ever". "It's been five years of hard work where the community has got together and worked extraordinarily hard to transform our town, and we can do it now," she said. "This is a true effort of collaboration and it's how regeneration should happen." More than 200 jobs are expected to be created and an estimated £6.7m brought in by additional tourism. The Onion Collective also predicts 100,000 more visitors to Watchet due to gallery events and a paper mill showing paper being made by hand. West Somerset Council's Brendan Cleere said: "This is fantastic news for Watchet and west Somerset." Planning permission was approved in June and the authority has since approved a lease on part of the land. The scheme is one of about 70 coastal projects to be awarded a total of more than £36 million from the government fund designed to "help develop and improve tourist attractions, create jobs and promote socio-economic growth". It is targeted to open in 2021.